Sound Examples - here are examples of just one piano sonata (Beethoven Piano Sonata F major Op 10 Nr 2), the entire corpus of stimuli comprised excerpts from twenty-five piano sonatas. Examples of experimental stimuli. First, the original version of a piano sonata was played by a pianist. This original version contained an unexpected chord as arranged by the composer (see middle panel in the lower right). 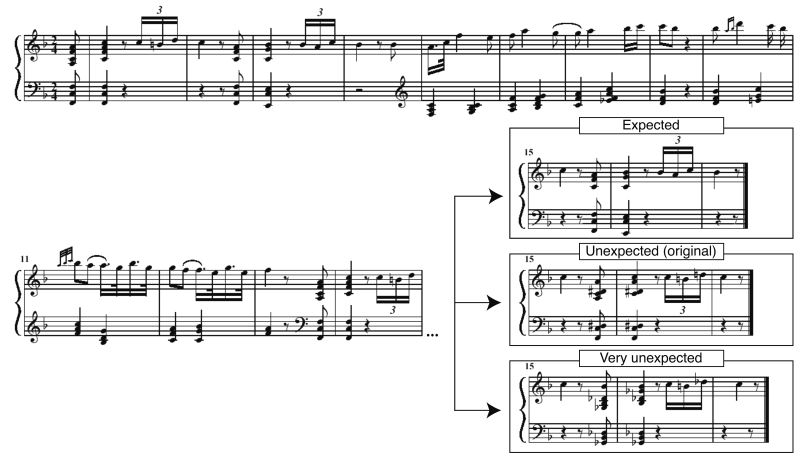 After the recording, the MIDI file with the unexpected (original) chord was modified offline using MIDI software so that the unexpected chord became expected, or very unexpected chord (see top and bottom panels). From each of these three versions, another version without musical expression was created by eliminating variations in tempo and key-stroke velocities (excerpts were modified offline using MIDI software). Thus, there were six versions of each piano sonata: Versions with expected, unexpected, and very unexpected chords, and each of these versions played with and without musical expression.